Labor Secretary Thomas Perez signaled Friday that DOL expects a legal challenge to fiduciary rule but that it will work with stakeholders on compliance. 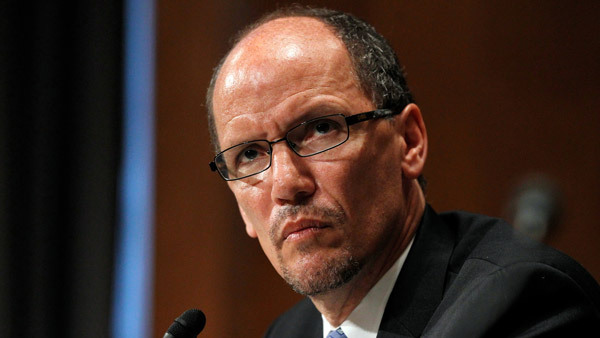 Labor Secretary Thomas Perez signaled Friday that DOL is braced for legal challenges to its rule to amend the definition of fiduciary on retirement advice. Perez, speaking at a Brookings Institution event in Washington about how retirement investment advice should be regulated, acknowledged that once the Department’s fiduciary rulemaking process under the Employee Retirement Income Security Act “reaches its conclusion,” other issues will “emerge,” and that DOL will move forward “thoughtfully and carefully” to address those concerns. Perez cited the recent challenge DOL faced against its final Home Health Care ruling to extend minimum wage and overtime protections to almost two million home care workers. Last June, associations of home care companies filed a lawsuit in federal court challenging DOL’s final rule. However, the U.S. Court of Appeals on Oct. 13 unanimously upheld DOL’s rulemaking. Perez noted that throughout the time the home health care rule was being challenged, DOL “worked with stakeholders” on complying with the rule. He noted the whopping 391,621 comments and petitions that came in during the conflict of interest rule’s comment period. More than 100 House Republicans told Perez in an Oct. 6 letter to tell them by Oct. 21 how DOL will make “substantial changes” to “shortcomings” in its fiduciary plan, but to also allow stakeholders to view those changes before issuing a final rule. Industry officials expect a final DOL fiduciary rule to be out in the first half of 2016. — Check out Spending Bill Rider May Be Best Way to Stop DOL Rule: Rep. Wagner Aide on ThinkAdvisor.